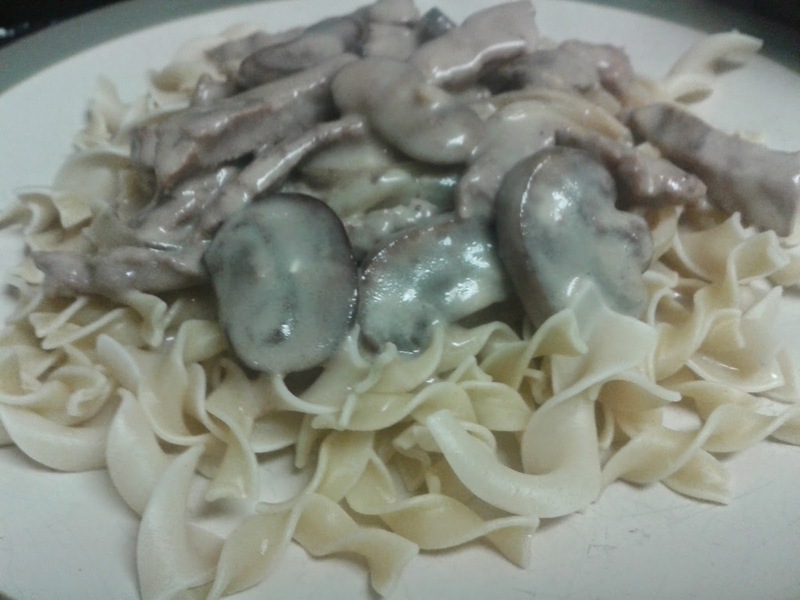 This is a great, traditional stroganoff recipe, that isn't too hard to follow. Ready in 30 minutes. 1 Cut beef across grain into about 1 1/2x1/2-inch strips. 2 Cook mushrooms, onions and garlic in butter in 10-inch skillet over medium heat, stirring occasionally, until onions are tender; remove from skillet. 3 Cook beef in same skillet until brown. Stir in 1 cup of the broth, the salt and Worcestershire sauce. Heat to boiling; reduce heat. Cover and simmer 15 minutes. 4 Stir remaining 1/2 cup broth into flour; stir into beef mixture. Add onion mixture; heat to boiling, stirring constantly. Boil and stir 1 minute. Stir in sour cream; heat until hot (do not boil). Serve over noodles.